Starring: Benedict Cumberbatch, Chiwetel Ejiofor, Rachel McAdams, Benedict Wong, Mads Mikkelsen, Tilda Swinton, and more. The superhero powerhouse, Marvel studios, makes its second film appearance of the 2016 year with their newest addition to their film multiverse in the form of ‘Doctor Strange’. Straying away from the super-powered heroes and diabolical villains, Marvel now introduces to the film world the mystical side of their universe. Now, with all past success put aside and audiences witnessing something far different from their typical Marvel movie, how will such a strange movie be received among its returning audience? (I know… I’m punching myself for that joke, but it is staying.) Well, time will surely tell but until then, it is time for the doctor to get Oberrated. 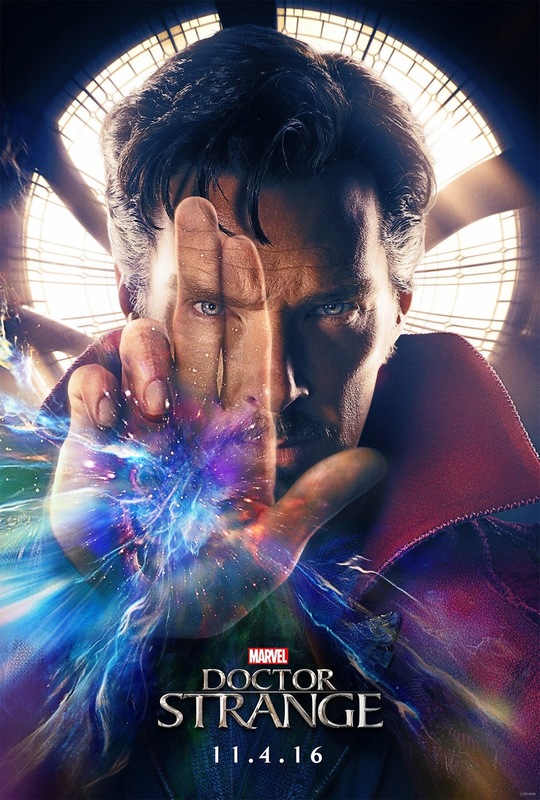 When a self-absorbed neurosurgeon by the name of Steven Strange (Benedict Cumberbatch) experiences a fatal car crash which not only shatters his hands beyond full repair but also shatters his entire life by ending his successful career, Steven must go to great lengths to discover a way to restore his former life. When his endless search leads him to the doorstep of The Ancient One (Tilda Swinton) and her followers at Kamar-Taj, Steven begs to be taught her ways of the mystic arts in order to gain his life back. Soon after witnessing his true power, he follows a path that surely veers away from his original intentions of finding a way to heal his hands. He becomes involved with a battle for humanity. ‘Doctor Strange’, as I anticipated, met my expectations well. Marvel has forever done such a strong job at creating stories and investing ones at that. As an introduction film, ‘Doctor Strange’ ranks among the top for me, sitting only behind ‘Iron Man’ and ‘Captain America: The First Avenger’. As I previously said, we witness a Marvel story that strays away from what we are used to. We are introduced to magic and spirit instead of genetically altered beings and high-tech suits… First and foremost, this was one of the most appealing-to-the-eye films Marvel has made. It is the best 3D movie I have ever watched in theaters and I would highly recommend to view in this format but of course, a standard viewing will satisfy as well. To my friends and myself, we each made reference to ‘Inception’, and ‘Doctor Strange’ surely gives off that feel, yet better. A wild trip for any viewer… I believe that Benedict Cumberbatch was made for this role. His suave charisma and witty intelligence carries the film with his every appearance on screen. Easily the star of the show, as if you would not have guessed that as is… From start to finish, ‘Doctor Strange’ was simply a wild and insanely appealing film to watch. Now, this part is for the viewers who want negative points on Marvel films and believe it or not, there are some, but I will deal with my thoughts on the negative Nancy’s out there shortly. Within ‘Doctor Strange’ I found the comedy (which is something many anti-Marvel viewers criticize frequently) a bit too much at times. There would be moments where it felt unnecessary and could have just been done without. Regardless of being too much at times, the comedy was still funny and initiated a laugh out of me but I can not silence my opinion of thinking it could have been done without… The dialogue in moments seemed drawn out. Seconds could have been shed off if certain parts were not so dialogue heavy and the story just continued with a natural flow. Again though, not movie breaking, but minor moments existed where I noted it… I had a point where I found an issue, personally, with Steven’s discovery of the awareness of Kamar-Taj. While this a spoiler if I were to delve deeper, if you wish to know, feel free to get in touch… Lastly, Miss Rachel McAdams. While I adore Rachel in most of her films, she just felt like an extra in this film. The unnecessary love interest that could have been done without and no one would have even realized she went missing. Might be just me, but you be the judge. Now for you Negative Nancy’s. While desperately seeking out negative points within a Marvel movie because you are simply an over-critical mind and can not accept that these movies are wildly successful BECAUSE this formula has been working and they fire to near perfection on a production scale, or you are simply a DC fanboy that desperately grips on to a “realistic story” or “more serious tone”, your realism and seriousness does not hide the bottom line of your movie being crap. For lack of better terms… These films have done so well that you can only compare them to one another or even a select few films beyond the Marvel Studios name. The worst of the multiverse can be seen as better than some of the better outside films. Nitpick all you want, these films are simply stronger and more well done than the typical movie. Bottom line: Sorry for the long review, and I appreciate you if you have read this far in its entirety. Bottom line is that I highly recommend a view or two of ‘Doctor Strange’. It is such a mind-blowing trip to view through its use of special effects. All actors and actresses bring their characters alive. It is fun entertainment for all kinds of viewers and is simply a show unlike any Marvel flick we are so used to. Posted in 2016 Movies, Marvel, Movie Review, Uncategorized.